Wi-Fi-connected plugs can add smarts to just about any dumb appliance. Air conditioning window units, space heaters, lamps; anything that has a switch and plugs into the wall. 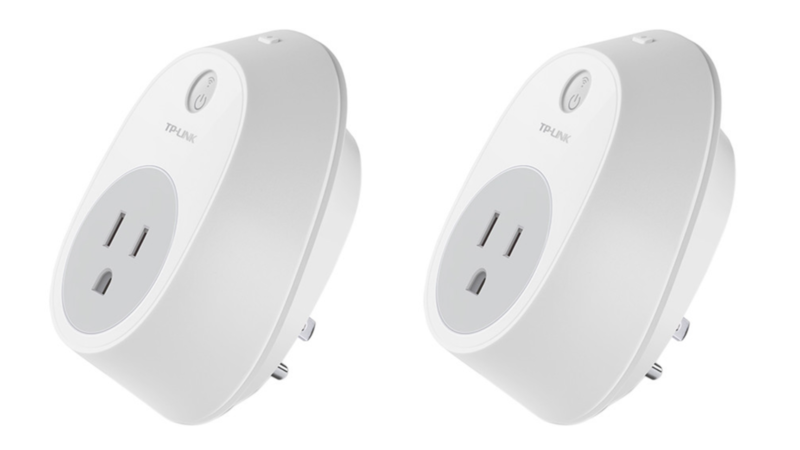 They're generally an affordable way to dip a toe in the smart home water, and this deal makes them even more so: today only, you can snag a two-pack of TP-Link's HS100 smart plugs for just 20 bucks at B&H. All the plugs do is turn power to the device they're connected to on or off when they receive a signal to do so over Wi-Fi, but their wide software compatibility means you can set them to trigger at just about any condition. You can use TP-Link's app to set the plugs to turn on or off at certain times or manually in response to certain phrases issued to the Google Assistant or Amazon Alexa. If you want to get more involved, you can use IFTTT to do stuff like turning on a light when you pull in the driveway, or flipping the AC on when the temperature crosses a certain threshold. You get two of these bad boys for $20, which is $30 less than the normal price. B&H doesn't actually have any in stock right now, but you can still order; they'll ship in seven to 10 business days. This is a very limited time offer that expires at midnight tonight, Eastern time. That's only a few hours, so get on it.